Do your limiting beliefs, stresses and anxieties hold you back from your career goals? Do you want to harness your fears and snag the job you love, win that promotion you deserve or find the career you enjoy? 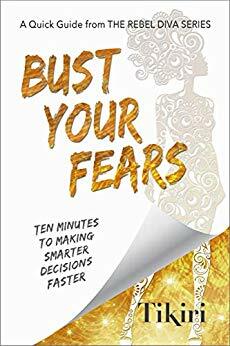 This short book gets down to the essentials to show how you can reel in your fears to make smarter decisions faster, so you can live the life you dream about. The five aspects of fear and how you can use fear to your advantage. The four essential mindset shifts you need to conquer your worries and limiting beliefs. Three easy-to-use tools you can apply within minutes at work or at home to make better decisions faster. If you’d like a shortcut to busting your fears and making choices with confidence and clarity you’ll enjoy this book. Learn from an award-winning author who used these techniques to go from being an almost-homeless immigrant teen to managing multi-million-dollar projects and traveling the world. Get access to a live course on busting your fears in the back of this book. Pick up Bust Your Fears today to conquer your worries and take action. This book is part of the Rebel Diva series designed for the busy working woman who’s juggling it all and wish life had more to give her. To learn more, go to www.RebelDivas.com.